Upstairs at Mikkeler by Chef Dan Bark is a tiny restaurant with only 5 tables that somehow managed to win a Michelin star. 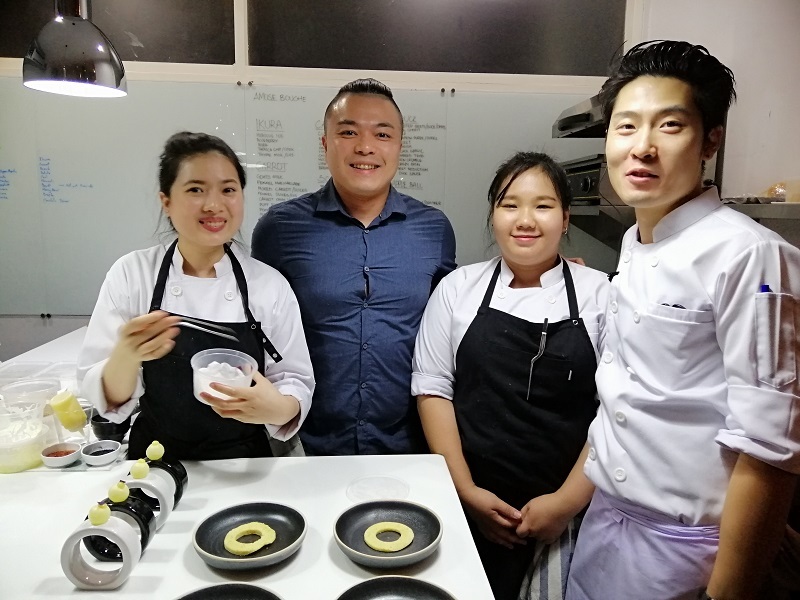 This was not entirely surprising as I have heard superlative reviews on the interwebs and from friends who have visited way before the Michelin Guide came to Bangkok. The Mikkeler brand is a craft beer brewer and Upstairs is literally the restaurant above the Mikkeler pub downstairs. There were way more chefs and waiters than actual diners in the restaurant. 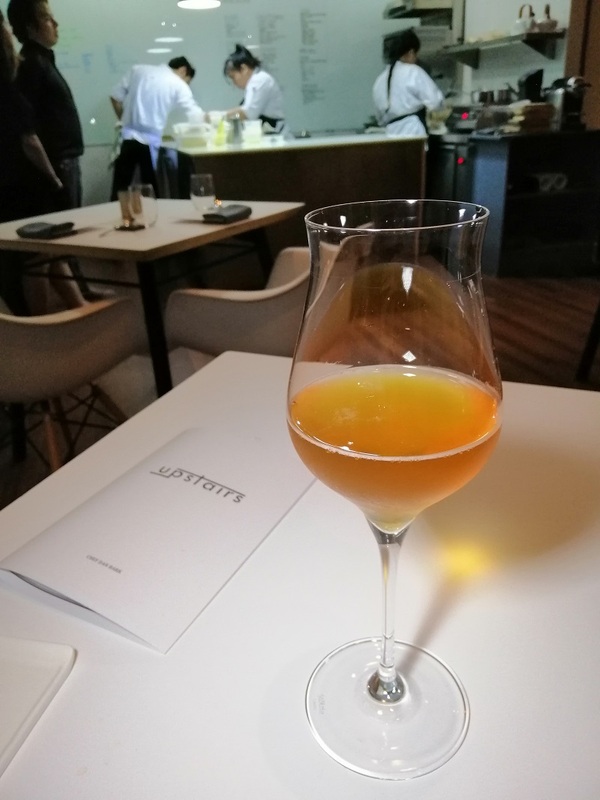 The food prep is laborious and Upstairs at Mikkeler is also famous for their beer pairing, a very modern take on the wine pairing at other upscale restaurants. They’re a brewer after all. There’s no menu available – Upstairs only offers a 10-course tasting menu for 3,800++ baht with an optional beer pairing menu for 1,300++ baht. I went for both since there’s no way I’m passing on such an unusual beverage pairing. 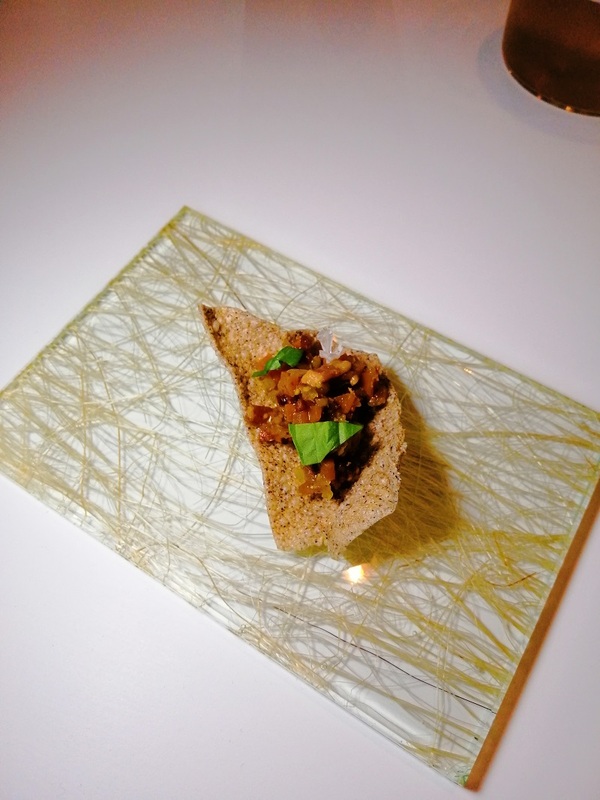 Dinner started with an amuse bouche that was not listed in the menu. There are more than 10 dishes because of this. My friendly waiter described this as Vanilla whipped cream with lots of passionfruit and a bit of oats. It’s supposed to be an acidic start to whet your appetite since sour is a known appetite stimulant. It works! 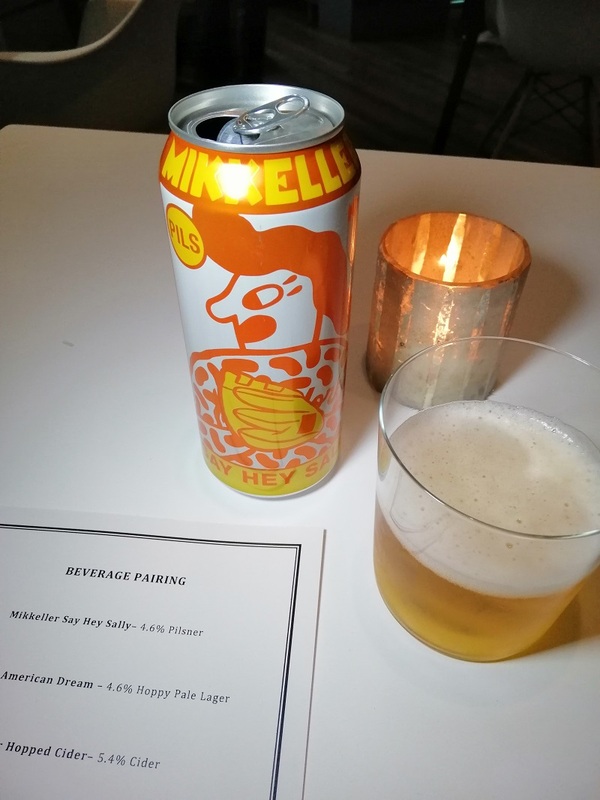 The first few courses were accompanied by Mikkeler Say Hey Sally, a 4.6% alcohol pilsner. There are 6 beers in total and they’re mostly from kegs or draft, but the beer pairing guy will bring you the can/bottle so you can see for yourself and take photos if you want. Mikkeler even provides a smartphone tray beside your eating utensils so you have a proper place to place your phone. I thought that was a funny and excellent touch. Bacon marmalade. Whole grain mustard. Maple syrup. Quinoa chip. It’s the perfect small bite before the meal proper. The chip was still warm due to the just-in-time preparation in the kitchen. Each course is only plated when they see you’ve finished the previous. The open kitchen and restaurant is small enough that the chefs can see your plates and tables. One caught me staring at her and smiled – that’s how small the restaurant was! 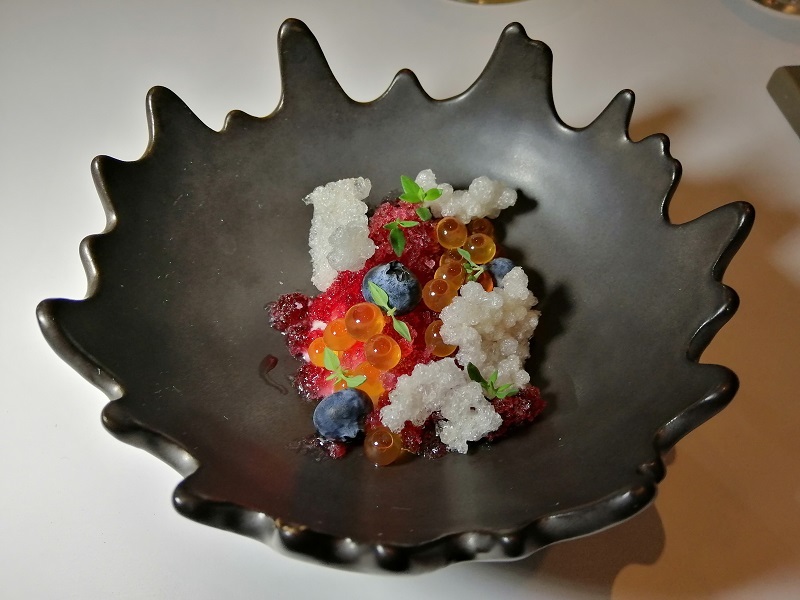 IKURA – blueberry, hibiscus, thyme was the real first course. 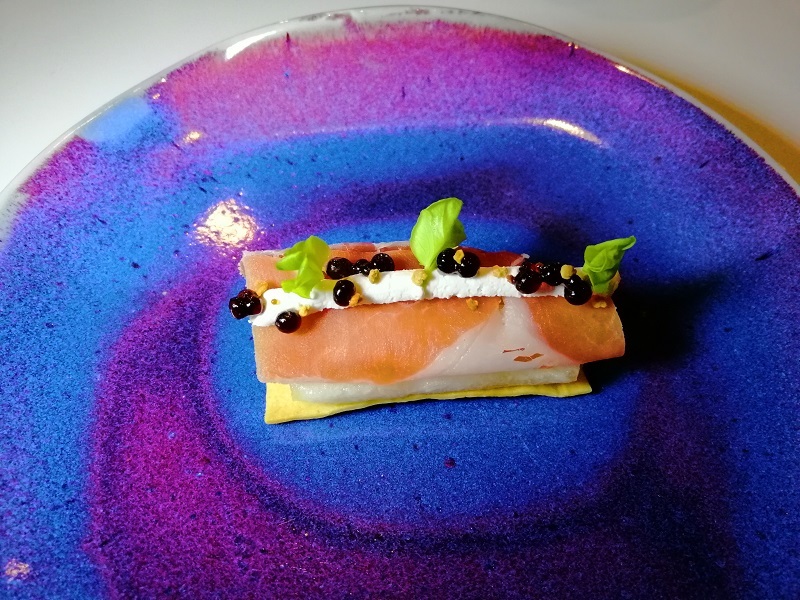 The bottom is thyme infused milk (excellent) with tapioca pearls and chips, hibiscus soaked water, and ikura (salmon roe) on top. It has a very unusual, bright flavor. To be honest, it doesn’t immediately register as good coz it’s so progressive but it’s certainly an intriguing dish. 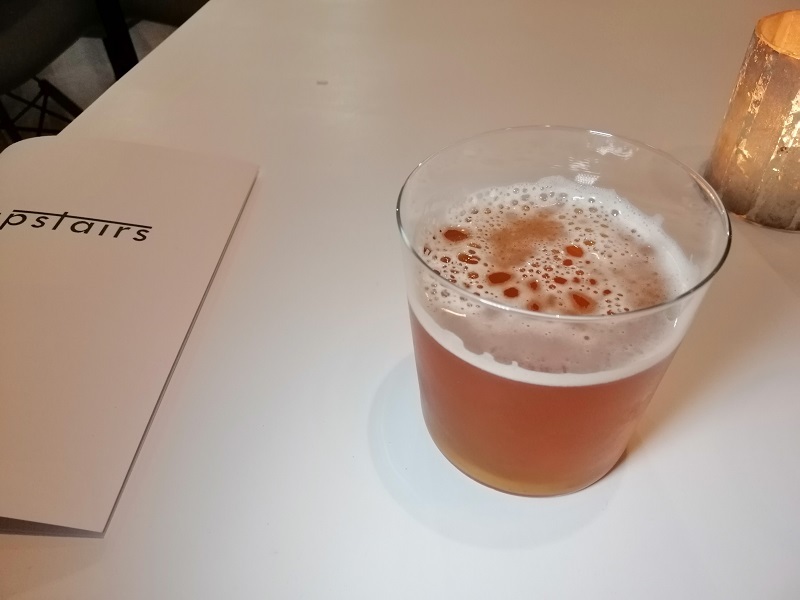 The upcoming carrot course signaled a change to the next beer – Mikkeler American Dream, a 4.6% hoppy pale lager. It was indeed very hoppy and bitter. The beer pairing guy explained that the next few dishes were sweet, so a bitter beer helps balances the flavors. I really like him. He’s a Thai guy who was born in Malaysia and he’s such a beer geek. It’s fun to learn from him. 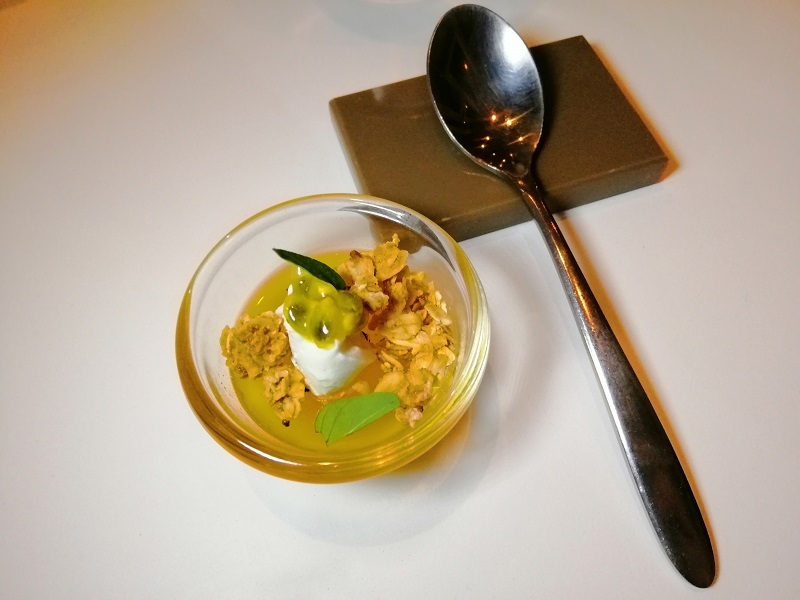 CARROT – goats milk, grapefruit, fennel is next. It’s carrot 6 ways (!!!) e.g. 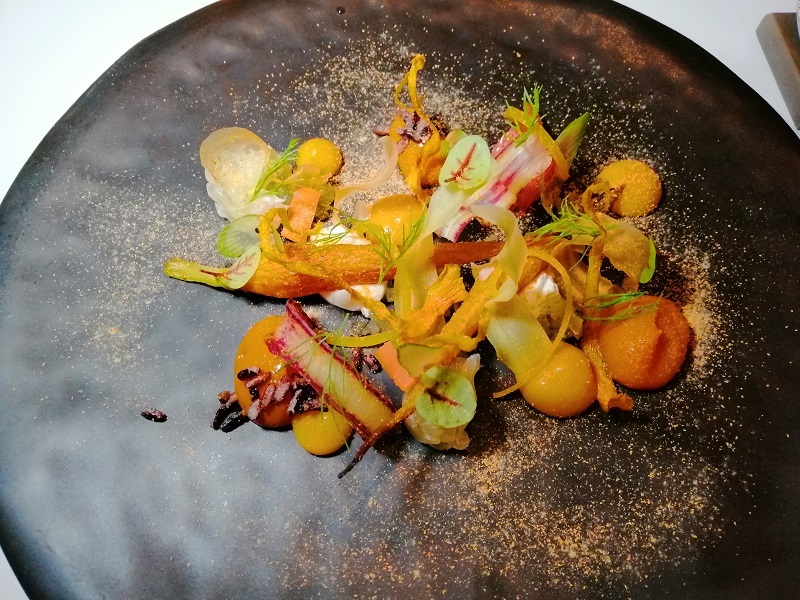 six different preparations of carrot from dehydrated carrot to puree. It’s paired with goat’s milk curd, fennel marmalade, lemon pudding. I really loved this dish! It’s delicious, sweet and goes well with the hoppy beer. There was also an extra course of homemade brioche with black lava salt and olive oil jam. This looks very simple but it ended up being one of my favorite dishes. Nothing beats good bread fresh out of the oven and the black lava salt really highlights the sweetness of the butter. The olive oil jam was delicious too. Very yums, but I know I can be biased coz I love bread. 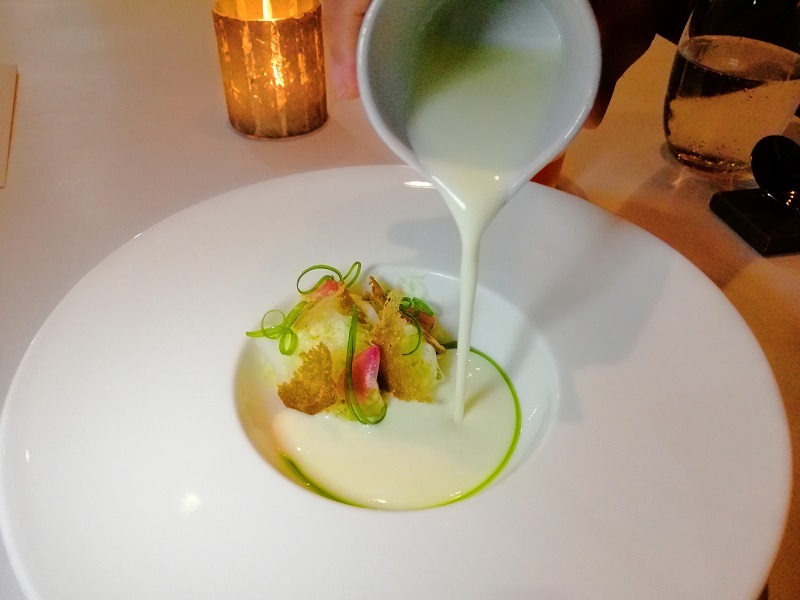 POTATO – bacon, cheddar, leek is the soup course. It’s very fragrant. As is the trend in fine dining, the waiter finishes the dish table side. I could smell it as soon as the waiter started bringing it over. It also has bits of shaved potato (including the skin) at the bottom which provides a nice textural element. It sounds simple but from the waiter’s description, the work that goes into a dish like this is not insignificant. They even make the bacon themselves. Zeffer Hopped Cider is next, a 5.4% alcohol cider. This ended up being one of my favorite drinks of the night. You know how commercial cider like Somerset is extremely sweet to the point of being off-putting? Other ciders go the opposite route and they’re so acidic it puckers not just your lips, but your entire body. 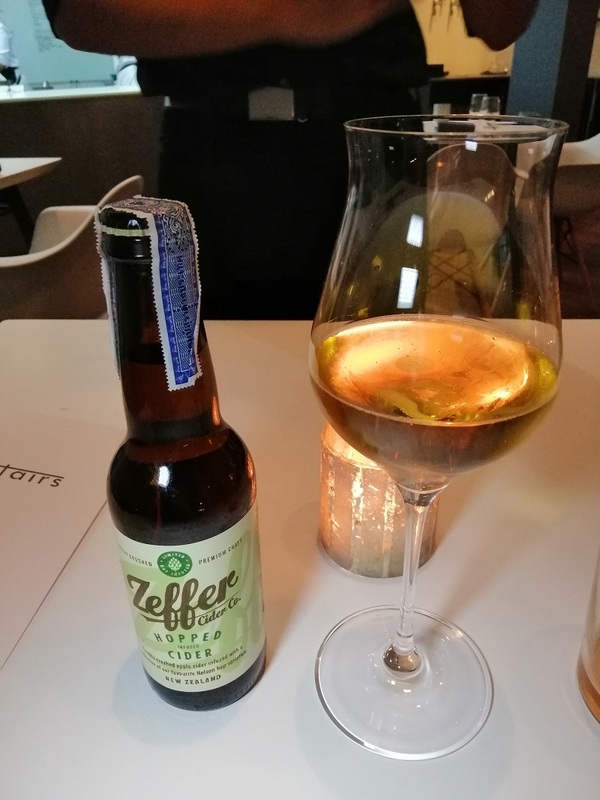 Zeffer Hopper Cider is the perfect balance – it’s not sweet, but not too sour too. It’s also bitter so it’s nicely balanced. Bittersweet, but more bitter than sweet. 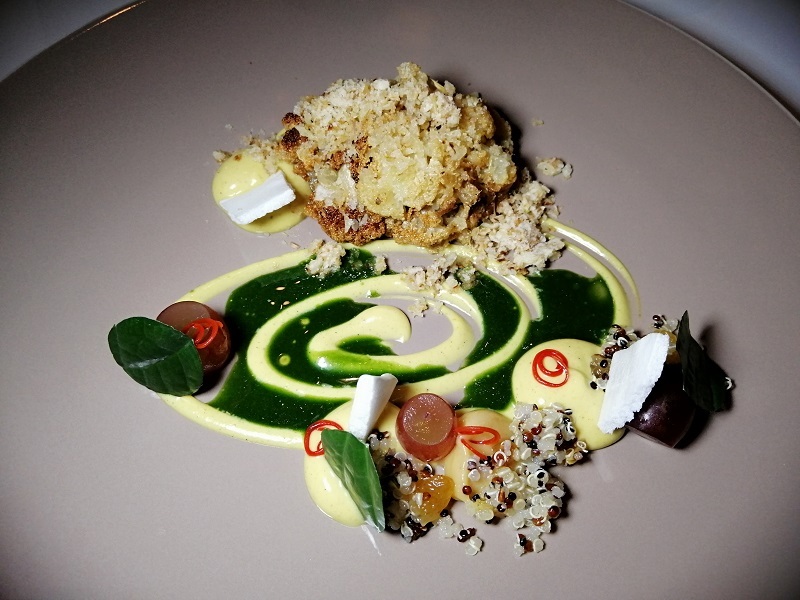 CAULIFLOWER – curry, grape, hoja santa. There’s grapes inside, which was pleasant. It adds a sweet touch to the salty curry. They also have sacred leaf, the Mexican leaf they use for cooking tamales. Upstairs only lists the first 3 ingredients of each dish so it’s up to you to discover some of the others and the waiter will give you a run-down afterwards. It’s a very textural dish. 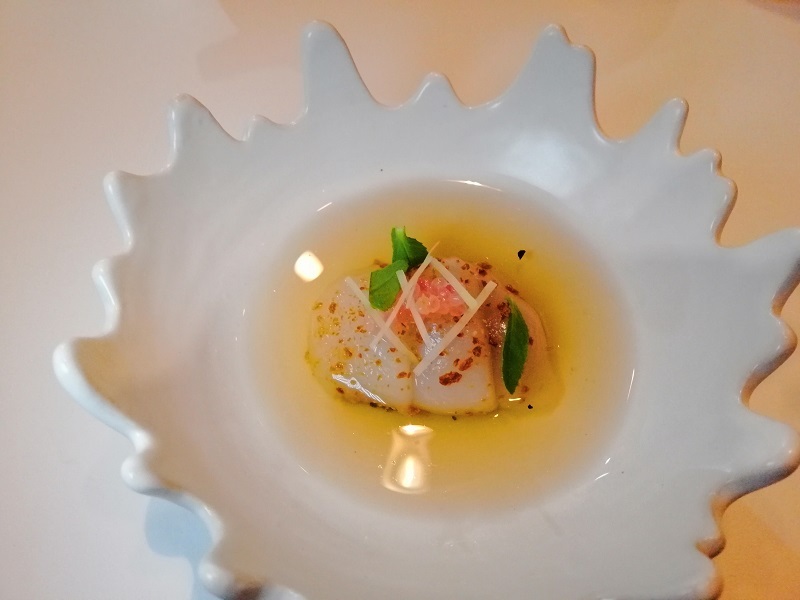 HOKKAIDO SCALLOP – finger lime, dashi, cinnamon. This is a very Instagrammable dish. 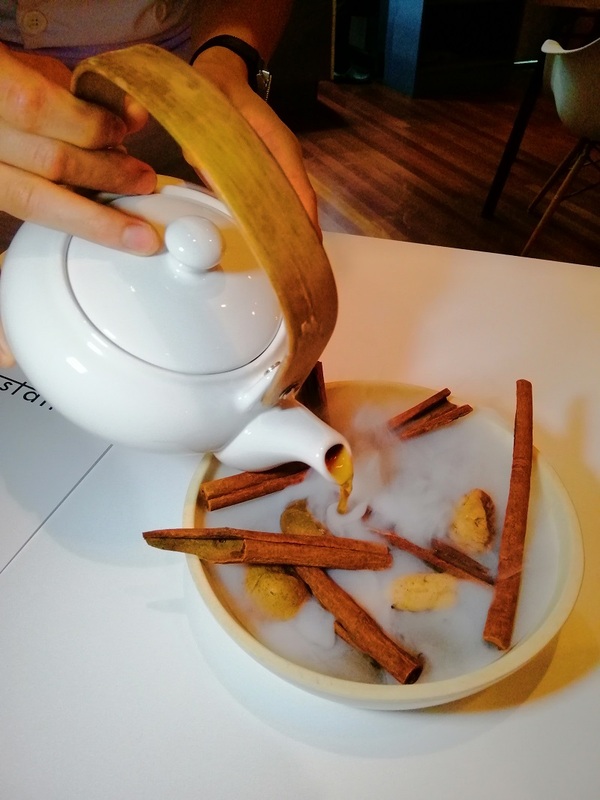 The waiter brought a bowl of cinnamon and stone with a teapot to my table. Upon serving the scallops, he poured cinnamon water over the cinnamon bowl to diffuse the essence of cinnamon over the table. He explained that the scallops were too delicate for cinnamon to be added directly so the chef thought of using smell to add the essence of cinnamon instead. This is also one of the first batches of finger lime they grow in Thailand. I’m familiar with the efforts to grow finger lime in Australia and they’ve started doing the same in Bangkok too. It adds a nice zest to the very fresh scallops in dashi. 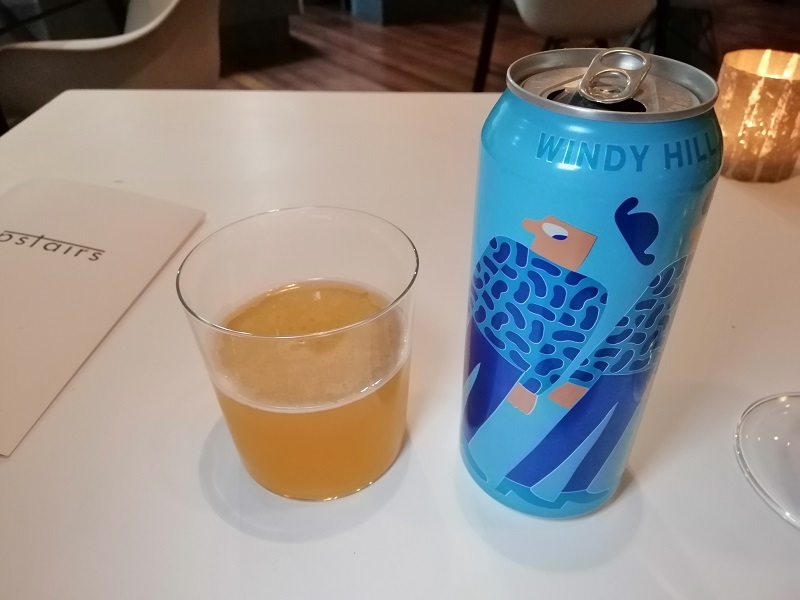 Mikkeler Windy Hill, a 7% New England IPA came next and it’s supposed to go with the upcoming 2 dishes. It has a heftier alcohol content to shift the dinner into the second phase. It’s a lighter tasting beer to wash away the fattiness of the next few courses. WAGYU BEEF – sherry, truffle, chive. This is Sanuki wagyu raised with beer. It’s proper Japanese wagyu raised in Japan and flown in, not the much inferior Australian cattle breed. There’s a shockingly delicious truffle paste to go with the beef, as well as chive powder and purple potato chip. I ate one of the slices by itself, one with the chive powder and one with the delectable truffle paste. They’re all yummy! The beef has lovely flavor and it’s not too fatty unlike some highly marbled wagyu. It’s also cooked perfectly – blue, which is raw inside. I love this dish to bits. The truffle sauce is intensely overpowering and pairs well with the beef. I could eat this all day. It’s my favorite dish of this trip. HONEY DEW – prosciutto, balsamic, white truffle. This is 16 month old prosciutto sprayed with white truffle oil. The waiter comes with a small bottle and sprays the white truffle oil right before you eat this. I was most impressed with the dense flavors within the 16-month-old prosciutto. That’s a long time to age meat! Why honey dew? That’s what it tastes like even though there’s no honey dew in here. Boon Lambiek, 7.2% lambic. A lambic is a type of beer from Brussels in Belgium. It’s for the last savory course and the pre-dessert. 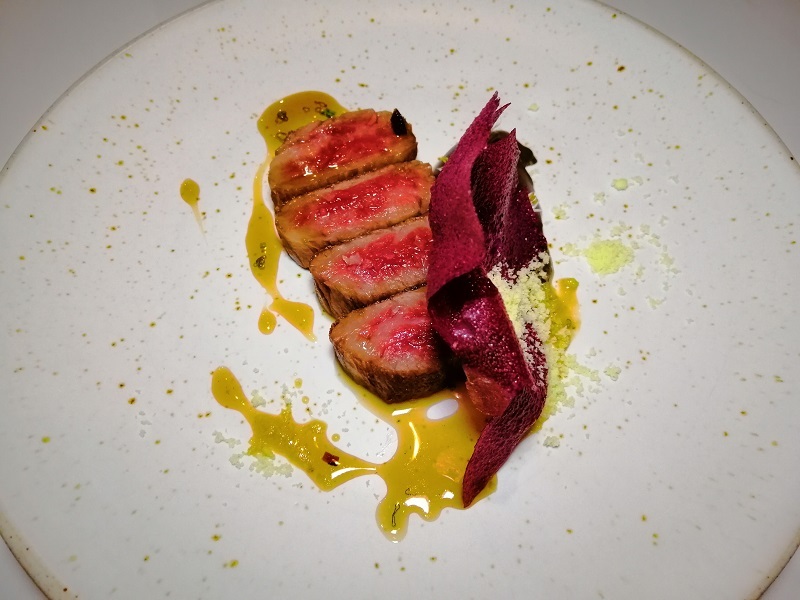 DUCK – beet, black garlic, pumpkin. 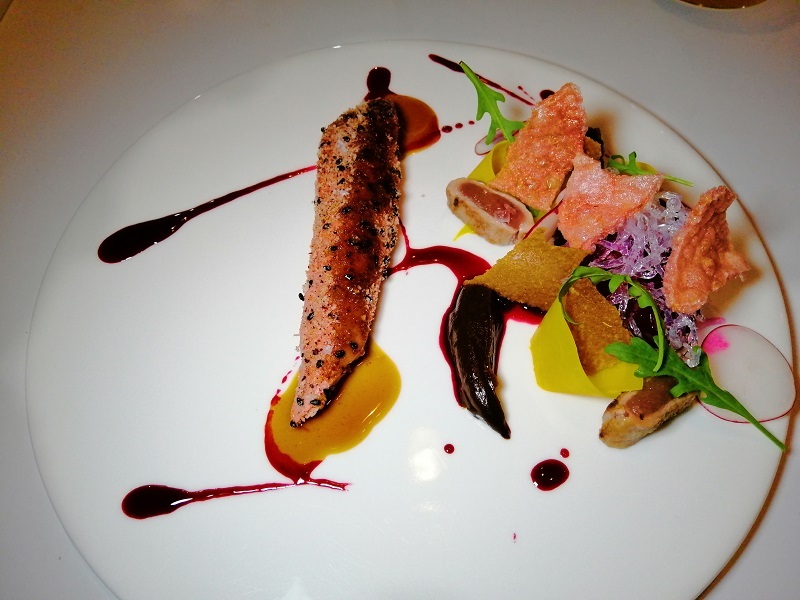 This is duck in 4 forms – sous vide, confit, grilled and fried. Upstairs also ferments the garlic sauce for 19 days! There’s pickled kelp noodle to go with the confit duck. The skin is fried. I like the main sous vide duck roll but the confit duck is off-putting to me. It’s so oily and cloying I found it impossible to enjoy it. This is not the fault of the chefs per se but a personal preference. I’m not a huge fan of confit duck and other such overtly rich preparations. 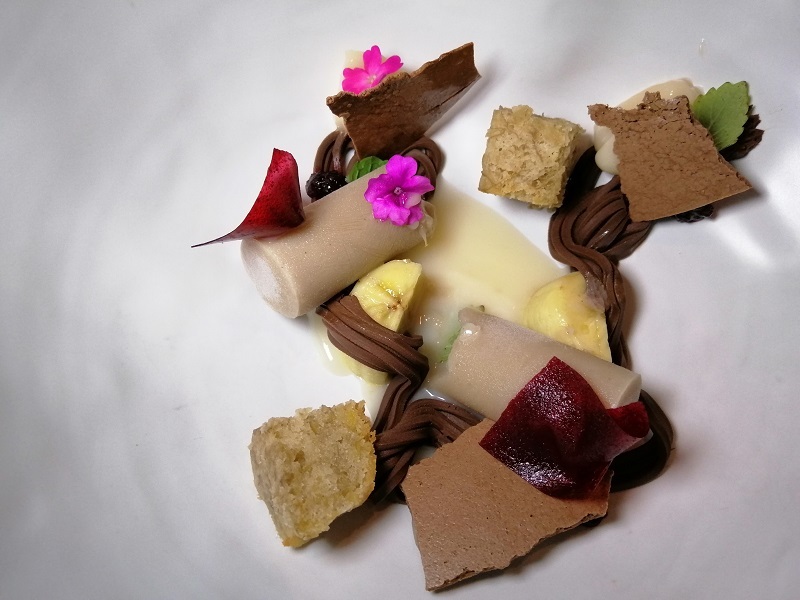 APPLE is the trendy dessert called a pre-dessert nowadays to kick start the dessert courses. 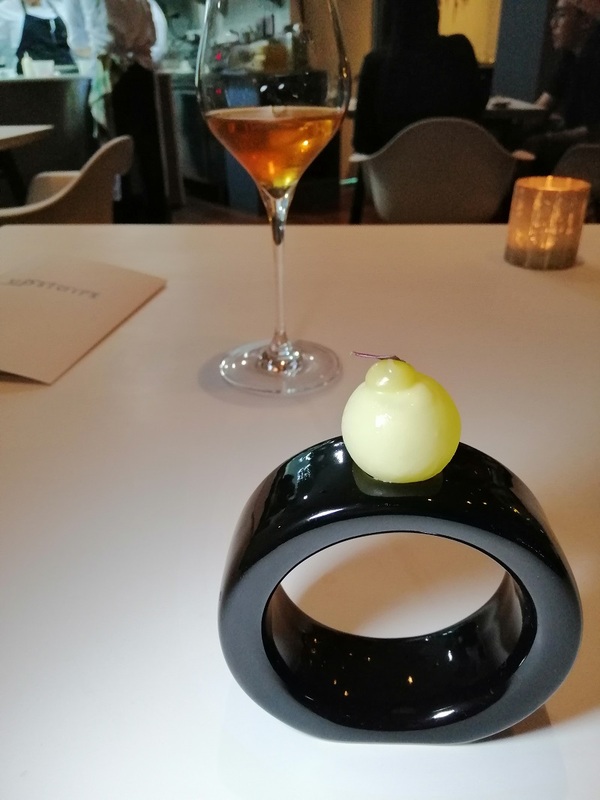 It’s served on a nice porcelain ring and it’s more like a palate cleanser since the shell of the apple is filled with liquid and it bursts in your mouth the moment you put it in. 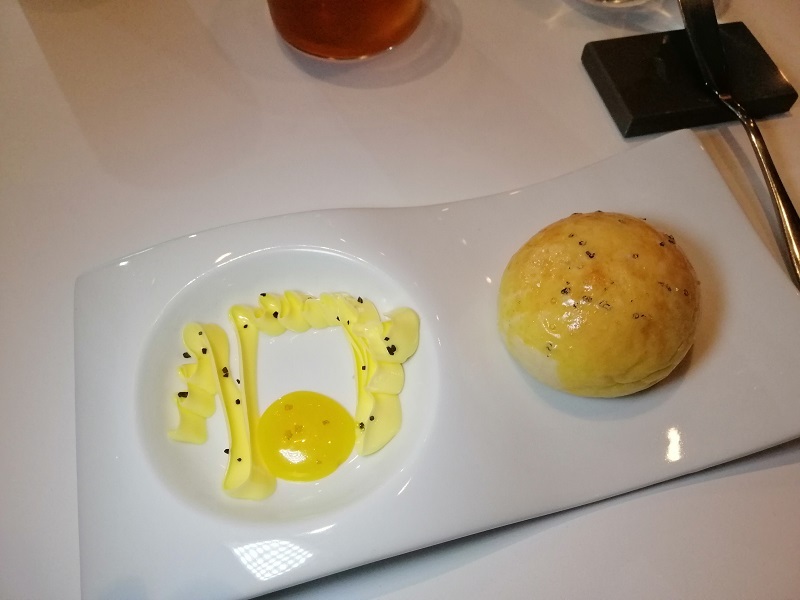 The waiter also warns you to eat this in one bite since there’s liquid inside. Mikkeler Beer Geek Thailand is the last beer pairing, a 10.9% alcohol imperial stout to go with dessert. It’s the perfect end since the bitterness balances out the dessert dishes well. This beer is inspired by mango sticky rice and it’s brewed with jasmine rice, mango, coconut and lactose. It’s like a bittersweet dessert beer. My second favorite beer after the hopped cider. 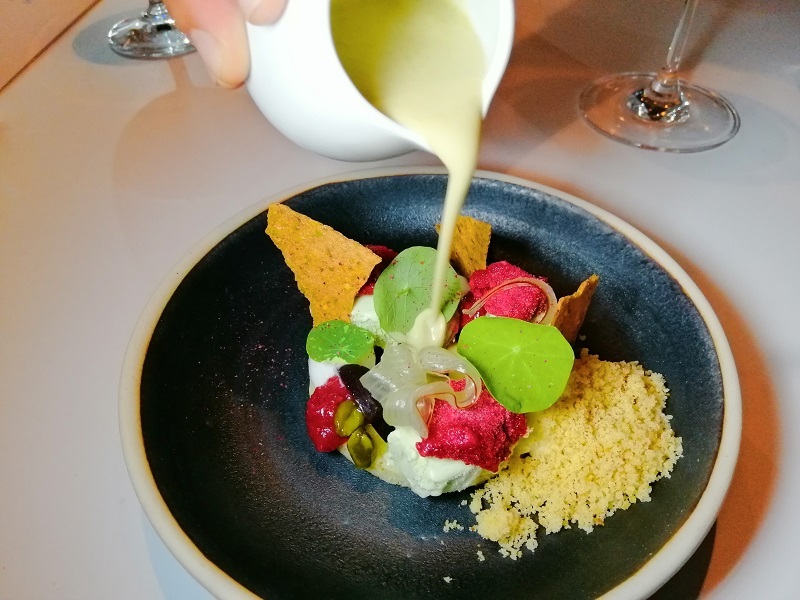 PISTACHIO – cherry, rhubarb, rose. This is my favorite dessert. It’s a mixture of different textures and flavors with bright notes like rhubarb, rose petals and herbs as well and deeper notes like biscuit crumbs, pistachio and cherry. A most excellent and balanced dessert plate. Wonderful stuff. 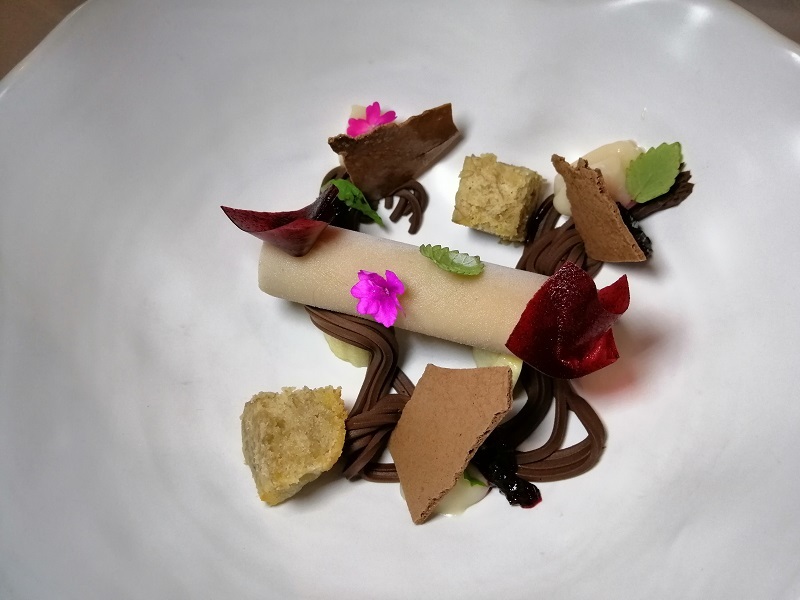 CHOCOLATE – banana, cranberry, yoghurt is a very sophisticated dessert. There are so many different chocolate preparations here – wafers, molds, ribbons etc. My favorite is the log filled with white chocolate and banana that oozes out when you cut into it. 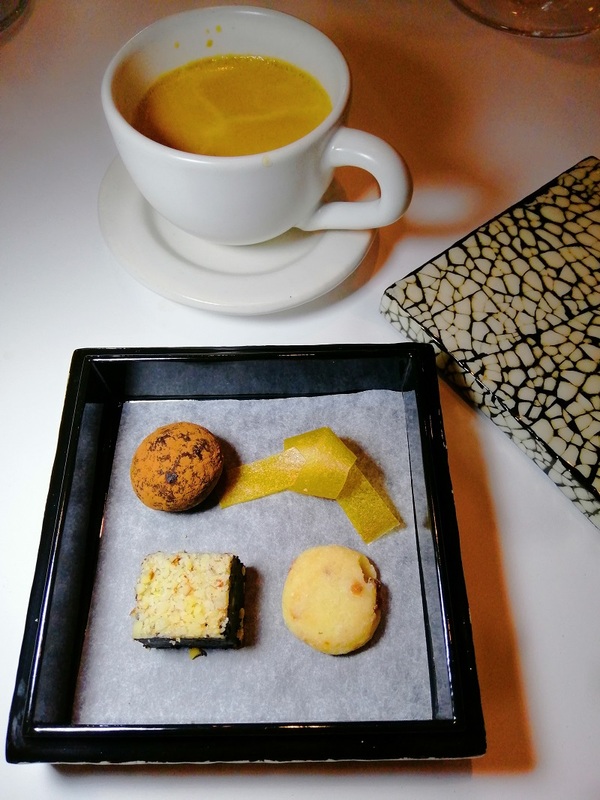 You’re served with coffee and a selection of petit fours to signal the end of the meal. I like the apple ribbon the most, followed by the chocolate chip cookie. I enjoyed my dinner at Upstairs at Mikkeler. 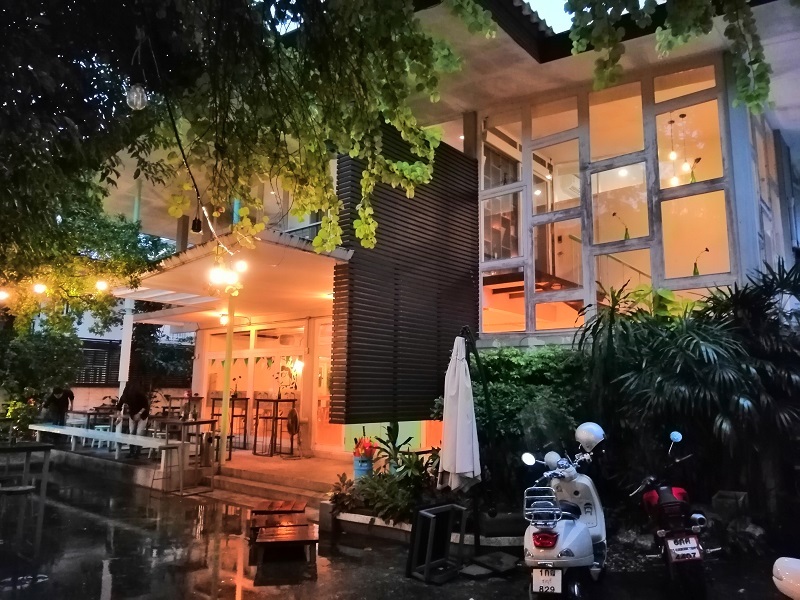 The bill came up to a hefty 6,333 baht (RM 804) for 1 pax inclusive of full beer pairing, coffee and water. 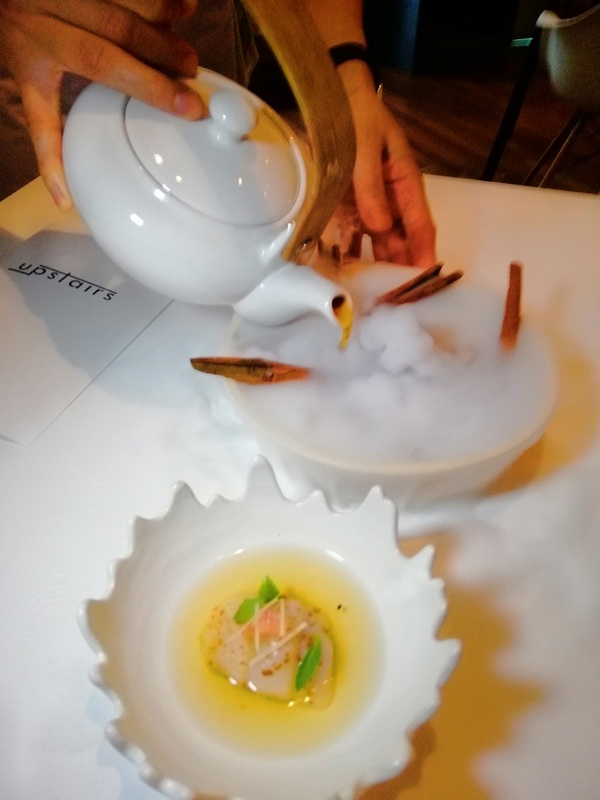 It’s half the price of Gaggan. The waiters are all very knowledgeable, friendly and they’re happy to share the preparation and stories that goes behind each dish. I liked the beer pairing guy too, an approachable true beer nerd from Thailand (born in Malaysia!). The food is good and the ambiance is great. 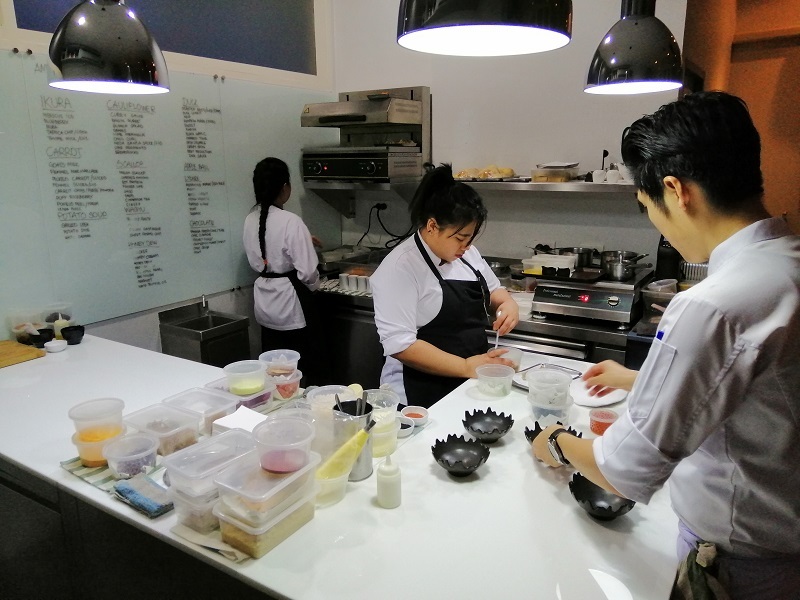 You can see the chefs working from your table – that’s how intimate the space is. Definitely recommended if you like beer and food.